I can remember being a handwriting monitor back when I was in primary school. Perhaps this is part of the reason why I still think handwriting, both printing and cursive, are important skills for kids to learn. We’ve recently had the opportunity to try out Rhythm & Writing with the Get Write Crew from Rhythm & Writing with our grandson who has had some struggles with writing. Rhythm & Writing is a fun handwriting program that uses a combination of hands-on practice, stories that you can read to your child, as well as instructional videos that keep little ones interested while delivering positive messaging like the screenshot below. EJ is a little older than some of the kids who are learning to write or working to improve their skills (he has ADHD and is dyslexic so it has been tough) but now he is ready for this writing program and wanting to ensure his penmanship is neat, tidy, and easy to read. We began the program as soon as it arrived by having EJ do the pre-assessment page. From here, he looked through his words and chose the letters he felt he needed the most help with; q and g.
He found that he preferred to work through the book without the webpage videos to supplement his learning, likely because of his age, but he also enjoyed sharing the videos with his little brother to help him along the right path of learning how to print. EJ has struggled with printing and writing in the past and, at times, has felt like giving up before he would ever be able to manage to print neatly. With Rhythm & Writing, he felt like he was more in control than other programs because he could start with the letters he felt he needed the most help with. He also liked that he could practice on the transparency included in the package with dry erase pens first before working directly in the booklet. He asked us to check his letters and circle the one we thought was best before he went on to the “real” ones. I like this product. I can see MJ enjoying it as he gets older and takes full advantage of using the videos in conjunction with the booklets. It is important for kids to start off on the right foot when learning the basics and not develop poor habits that are tough to break in the future. I really like how this program works with little songs for the kids to remember while creating their letters. Much like the mnemonics we used to learn the number of days in each month when we were kids. It’s a great way to help them remember the process. I also appreciate the step-by-step process on the curves of the letters. Often you will see a “1 + curved arrow” around the belly of an “a” but this program has the curve broken down into parts to be sure kids notice the curve all the way around. I found this encouraged EJ to properly form his letters. Overall I found Rhythm & Writing with the Get Write Crew to be a good fit for our family and I have no hesitancy to recommend this to families with kids who are learning to print. 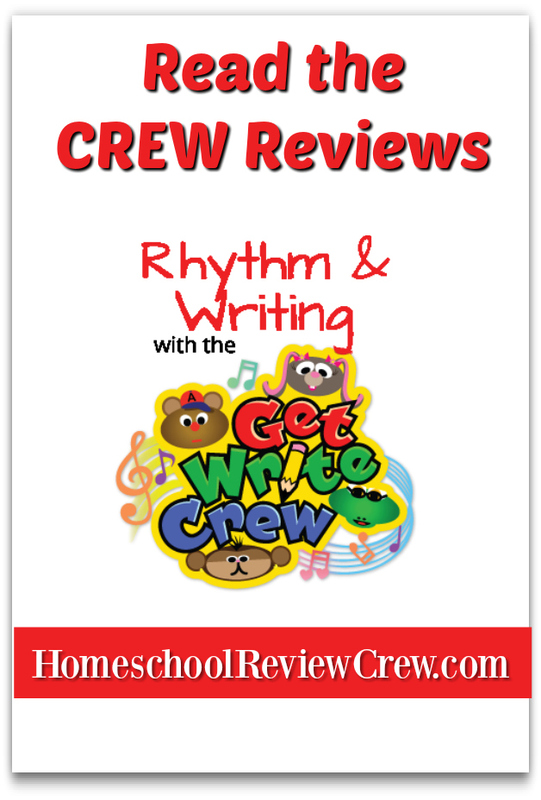 Please be sure to check out what other Crew families thought about Rhythm & Writing with the Get Write Crew by clicking the image below.